Customized outerwear makes for an excellent promotional tool anytime the wearer is out-and-about. That's why ePromos has top quality personalized windbreakers, custom zip up jackets and custom team jackets available for you today. Get your clients and employees ready for the cold weather by giving them a warm and stylish gift they will appreciate. All eyes will be on your brand in no time! The men’s The North Face Canyon Flats Hooded Custom Fleece Jacket is perfect for hiking, biking and pretty much anything outdoors. The durable, smooth-faced fleece hoodie crafted for warmth. Elevate your fashion sense with lustrous Clique half-zip pullover custom jackets that everyone will admire. The women's Elevate Tremblant Custom Knit Jacket has a feminine silhouette and is super comfortable! It resembles a classic knit jacke and features including an upper chest pocket with and earbud port. Perfect for cold weather, this men's Elevate Two-Tone Knit Half Zip Custom Jacket provides the wearer a cozy feel with a sporty vibe. It features color blocked sleeves and a half zip closure. Ideal as a gift giveaway or as an office uniform! Show your team spirt and promote your brand with these Team 365 performance custom jackets imprinted with your custom logo. When you combine function, style and comfort together, you get these Elevate Jersey Knit Custom Jackets that are perfect for any occasion. Make your employees or top clients stand out and feel better about themselves by giving them these Under Armour Qualifier quarter zip custom jackets imprinted with your corporate logo. When you want to separate yourself from the competition, then your associates wearing these North End bonded fleece custom jackets will do it! 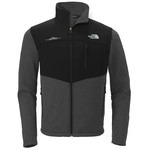 The North Face Far North Custom Fleece Jacket combines a breathable mid-weight fleece with durable WindWall stretch overlays that allows you to move with ease and wear for just about any occasion. 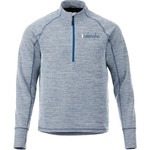 The men's Elevate Tremblant Custom Knit Jacket is eye-catching and comfortable! It resembles a classic knit jacket, but it has updated features including an upper chest pocket with and earbud port. Your team look champions when they are wearing these amazing Team 365 championship custom jackets imprinted with your logo. We've got something for everybody – men's, women's and children's styles and sizes are all available. Our customization options include logo placement and embroidery on any of our top name brand jackets for a professional look and feel. Your employees, potential business partners and current customers will love your promotional clothing. Clients will be comfortably showing off your brand at important meetings, corporate lunches, and non-business events. For your next employee appreciation initiative, consider promotional jackets for them to wear during casual presentations or trade shows. With trusted brands like Columbia, Cutter & Buck, Eddie Bauer, Nike, The North Face, Puma and Under Armour, they'll never want to take it off! Get in touch with one of our graphics specialists today to start taking full advantage of promotional clothing campaigns. We're on standby waiting to help you find exactly what you need!